This year Guillemot Press was invited to curate a day at the Bodmin Moor Poetry Festival. If you don’t know it already, BMPF is a little gem of a festival. It’s intimate, inclusive and always surprising, set out on Bodmin Moor at Sterts Theatre, near Upton Cross in Cornwall. For us, it was an opportunity to invite some of our favourite poets and artists and we put together a list of established poets that included Thomas A Clark, Vahni Capildeo, Holly Pester, Luke Kennard and Holly Corfield Carr, as well as some excellent newer voices who are very quickly establishing themselves, including Elisabeth Sennitt Clough, Sarah Cave, Aaron Kent and Amy McCauley. Amy’s performance of Oedipa was staggering. We had the privilege of publishing Amy’s debut in May this year and to see it brought to life in this incredible, visceral way was so exciting. Amy will be giving Oedipa a Manchester launch on July 2nd. Do try to see her if you can. But this was a day with so many highlights. Luke Kennard and Holly Pester were hilarious and intoxicating. Vahni Capildeo’s reading was beautiful, with poetry from recent collection Seas and Trees and from her newly-announced Forward shortlisted collection Venus as a Bear. Then there was Thomas A Clark, reading from his latest collection wing of the ptarmigan. The pace, the quiet and the meditative repetition of his reading was spellbinding. Tom had an exhibition in the theatre’s gallery, too, with fragments of landscape made from jigsaw pieces, a t-shirt printed with the words ‘and once I was a dragonfly for an afternoon’, and a series of cards and tiny publications. It was a fascinating use of a small space. Then we had a panel of our wonderful illustrators, featuring presentations and conversation with Emily Juniper, Rose Ferraby, Phyllida Bluemel and Lucy Kerr. These are some of the artists we’ve been working with recently to produce illustrated poetry books of work by Amy McCauley, Melanie Challenger, Martyn Crucefix and Nic Stringer. Lots of themes and ways of approaching texts were shared among the artists, in spite of their styles and practices seeming so different. Emily’s sense of ‘dressing’ the text when she spoke of her Medea and her work on McCauley’s Oedipa was fascinating, as was Rose’s textures and geography, Lucy’s ambiguity and Phyllida’s sense of the many lives of the poem. The day ended well into the night, across the road at the Caradon Inn. Memory is hazy, but the Guns N Roses karaoke and a drunken man reciting Macbeth at Holly Pester in the beer garden as a lightning storm approached were special highlights. We were allowed to run the bookshop for the weekend, which was a greatopportunity to present a range of books by some of our favourite small presses, such as Clinic and Moschatel, as well as individual titles from further great small poetry publishers, like Sad Press, Periplum and zarf, and of course some of the bigger hitters, like Carcanet, Faber, Penned in the Margins, Seren and Shearsman. Throughout the weekend we were helped out by a team of students from Falmouth University who deserve mention. The weekend wouldn’t have worked anywhere near as well without Adriana Ciontea, Rhianna Gibbs, Jamie Andrews, Izzy Nieto, Gavin Hedaux and Ceire Warren, while Charlotte Rayment and Seren Livie wrote brilliantly for the festival throughout the build up and Kevin Woodley developed and managed the Bodmin Moor Poetry Festival website. Thanks are owed to them all. And this was only the day we curated. There was so much great stuff either side of our Saturday, all put together by David Woolley and Ann Gray. A regular feature of the festival is Rachael Allen’s ‘Poetry Cabaret’, for which Rachael brings down a host of poets for an informal series of short readings on the opening night. This year Rachael brought Zaffar Kunial, Daisy Lafarge and Calum Gardner. Elsewhere over the weekend were performances by Liz Berry, Mark Ford, Eilean Ni Chuilleanain and lots, lots more. Guillemot Press is uncontainably thrilled to announce a new collaboration beginning in 2018 between Guillemot Press and The Word Factory. The Word Factory is the most exciting short story organisation around, as well as a fantastic developer of new writing talent. 2018 will be our first year working with Cathy Galvin and her team, releasing short story pamphlets from award-winning writers Jessie Greengrass, Adam Marek, David Constantine and Carys Davies. What’s more, this 2018 series of story pamphlets will be illustrated by the artist and comic book maker Donya Todd. We have had an eye on Donya’s work for some time now and leapt at this opportunity to work with her. Every new venture deserves a new logo, and this little beauty (above) was made for us by another exceptional young talent, CF Sherratt. From a publisher’s perspective, the pairing of Rose and Melanie Challenger was a natural one as they have shared many of the same landscapes, in Cambridgeshire, Scotland and Yorkshire. ‘Melanie’s language tapped into my own memories of places’, Rose said. When Rose was in charge of the camera, we managed a few better photos of fellow award-winners Charlotte Wetton (Poetry Award) and The Poetry Business (Publishers’ Award), as well as some of the short-listed poets (congratulations to Alyson Hallett, Phoebe Stuckes, Theo Kwek and Natacha Bryan). Testament to how well all the poets read, the pamphlets were sold out by the time we got to the stall. We’ve had a great 2017 and have a big 2018 planned too, with exciting new poetry from writers both established and new, as well as new fiction, exhibitions, collaborations, festivals and lots more . Details will follow in the New Year. Have a Happy Christmas everyone! This November we’re celebrating the launch of our autumn titles with Andrew McNeillie, Martyn Crucefix and Nic Stringer, and a pop-up exhibition by artists Phyllida Bluemel and Lucy Kerr. 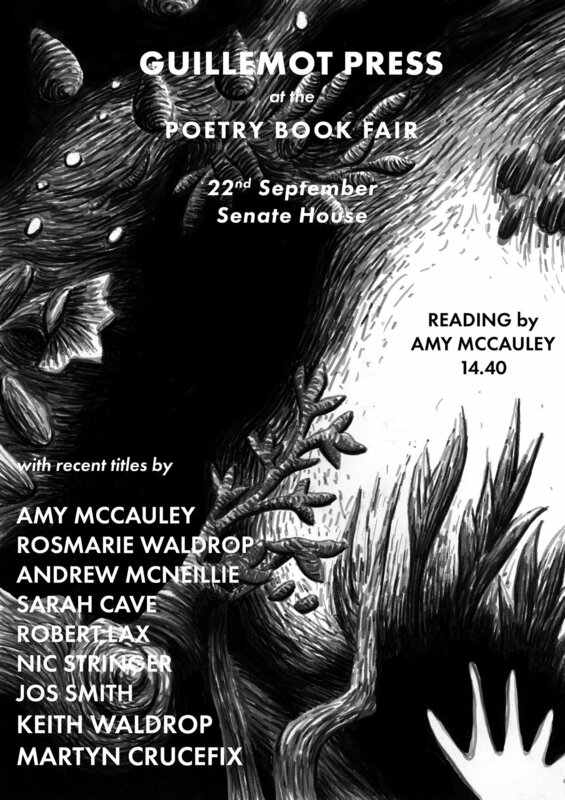 This is a chance to meet the writers and artists of our very latest titles, to pick up your copies and get them signed, and to hear all three of our poets reading from their new Guillemot Press collections. Entry is free and we look forward to seeing you there. I have a print-out of O at the Edge of the Gorge covered in pencil scribbles and tiny indecipherable thumbnails of visual ideas. Putting images to poetry can be daunting. I find that, armed with a pencil, a close reading of the text and lots of doodling is a good place to start. I thought a lot about the point of illustrating poetry – what the images can bring. I want the illustrations to be in conversation with the poem, rather than just replicating images already present in the words. Starting with an intuitive visual response is a nice way to get the conversation started. For me the poems read like an unforced train of thought – a notebook in the pocket of a traveller, a sun-drenched jotting of linked observations and associations and memories – the kind of meandering thoughts that are particular to a slow and hot afternoon. They are very evocative of place. I was taken with the formal playfulness of the poems – the crown of sonnets – where emphasis repeats and changes and each poem flows effortlessly into the next. An enacting of Martyn Crucefix’s line “he snaps them sketches then revises again”. It seemed appropriate to echo that in the imagery. The folded and interrupted illustrations bind each poem to the next. I wanted to give myself some of the constraints that the poet had set himself – and nearly every image contains an element of the one before, re-appropriated and carried forward – a visual game of Chinese whispers. The poems move from one image to the next but there are the same preoccupations – the specks and the flocks and movements alongside monuments and geology – contrasting contexts of time, and the sense (especially given the form) of something trying to be ordered or sorted out, but not quite complying – “dicing segments of counted time…” The diagrammatic, map-like – but not-quite scrutable imagery is a response to this – an attempt to make sense of forms and information, or grasp a particular memory and note it down. Not quite successfully. We are left with a string of related thoughts and a measuring or structuring impulse. The imagery itself takes its leave from the words – an outlined lavender stem becomes a cross-section, a contoured landscape, which in turn ends up as the outline of a branch, twisting into the form of the river at the bottom of the gorge. I had a lot of fun playing with scale and the way in which lines taken from nature mimic each other. This felt right because of the shifts in perspective in the poetry – from the raptor’s eye view, to the ‘snufflings’ and ‘scratchings’ of detail. The buzzard’s diving and ‘zooming-in’ of the landscape. The use of newsprint for the folded pages is as much an act of ‘illustration’ for me as the lines. Maps and diagrams and lines interrupted by folds and the edge of the pages make it feel as if they are part of something else – ephemera or a dog-eared map folded, or a napkin sketch ­ – tucked between the pages of a notebook. I also think it’s OK to want to make a beautiful object for the sake of a beautiful object – the tactility of different paper stocks, the small and pocketable size of the book – all I hope lend themselves to a thoughtful reading of the poem. The scraps and scribbles that eventually became O. at the Edge of the Gorge are contained in a notebook dating from March 2014. The first words that made it into the finished sequence record my sighting of “6 white doves / on the boundary wall / looking away”. I’m pretty sure I spotted the birds on the drive to one of the airports north of London as, on the same page, sits a note recording a tannoy announcement calling a customer back to one of the shops in the Duty Free zone: “please return / to Glorious Britain / for a forgotten item”. These are the sorts of strange happenstances that get thrown down in a writer’s notebook; happily, it was the dove image that stayed with me. The landscape of the poem is the destination of my flight that day, the Marche in central, eastern Italy. I was staying in a house close to the edge of a deep gorge, looking out to distant hillsides, several hilltop villages, their church spires, clumps of dark trees. The roots of the poems – any poem, of course – spread much deeper than is immediately visible. So earlier in the same notebook, I find I had noted a quotation from Schopenhauer (itself quoted by Dannie Abse in the May 2014 issue of the magazine Acumen): “Envy builds the wall between Thee and Me thicker and stronger; sympathy makes it slight and transparent – nay, sometimes it pulls down the wall altogether and then the distinction between self and not-self vanishes”. A little earlier, there was another note. This was from a piece by Ed Hirsch in the magazine The Dark Horse. Hirsch quoted Simone Weil’s observation that “absolutely unmixed attention is prayer”. He went on to urge our attention ought be paid to the earth, not looking for something atemporal and divine. We need to cherish the fleeting and the transient, even in its disappearance. This is the particular project of poetry, he argued, and these are recognisably Rilkean ideas that were always likely to attract my interest. I have spent many years translating Rilke’s Duino Elegies and Sonnets to Orpheus. The Orpheus link took a while to re-surface in my mind in relation to the new poems. One other notebook entry stands out. I seem to have been reading Bruce Bawer’s book, Prophets and Professors (Storyline Press, 1995), and in a chapter on Wallace Stevens he quotes Mallarme: “To name an object is largely to destroy poetic enjoyment, which comes from gradual divination. The ideal is to suggest the object”. It’s not necessary for a writer to fully grasp such scattered sources; they tend to be ripped out of context and appropriated for use. In retrospect, I seemed to be thinking, over a period of weeks, about the relation between self and other, the paying of attention to the transient world and the difficulty of maintaining such attention through the medium of language. All of this re-appears in the poems that make up O. at the Edge of the Gorge. Also by this time – probably July 2014 – there were two strong poetic voices chanting in my head. One was from poems I was trying to translate by Peter Huchel, poems written in the highly censored context of the GDR in the mid 20th century. I find I’d scribbled down “his vision is up-rooted, deracinated in the extreme – a world where meaning has withdrawn (the jugglers have long gone) what’s left is iron, winter, suspicion – spies, the Stasi, meaninglessness – but the natural world persists”. The other voice was from the Ancient Chinese texts of the Daodejing which I had also been versioning for quite a few months previously and were eventually to be published in 2016 by Enitharmon Press. In complete contrast to Huchel, the Daodejing’s vision is one of ultimate unity and wholeness achieved through such an intense attentiveness as to extinguish the self and all barriers. These two extremes seem to form a key part of the sequence of poems that emerged in the next few weeks, my narrative voice moving from a Huchel-like sense of division and isolation to a more Dao-like sense of potential oneness. Besides all this, I was playing in the notebook with the idea of ‘off’’. The point was, rather than focusing where the ‘frame’ directs us, we gain more from attending to what lies beyond it; the peripheral, I suppose, in a kind of revolt. I was muttering to myself “locus not focus”. I was thinking of the lovely word ‘pleroma’, a word associated with the Gnostics and referring to the aggregation of all Divine powers – though, as with Ed Hirsch, I was not so much interested in the Divine. Pleroma is the totality of all things; something like the Daoist’s intuition of the One. I think such ideas gave rise – quite unconsciously – to the several swarms, and flocks, the “snufflings the squeals and scratchings” that recur in the poems. These represent the fecund variousness of the (natural) world to which we might be paying more attention. The hilly landscape and the plunging gorge itself also seem to suggest (at first) a divided vision. The carpenter bees act as intermediaries – at first alien, later to be emulated. As the first rapid drafts of individual poems came, there was a plain lyric voice – an ‘I’ – in a sort of reportage, revelling in the landscape, its creatures, colours and sounds till eventually I had 12 sonnet-like pieces. One of the poems seemed already to allude to the Orpheus myth, the moment when he looks back to Eurydice and she is returned forever to the underworld. His mistake, in this version, was that he was seeking an over-determined, “comprehending grip on earth” as opposed to a more passive openness to the phenomena of the world (which Eurydice seemed now to represent). At some stage, the narrating ‘I’ was switched to a ‘he’ and the ‘he’ began to feel more and more like a version of Orpheus himself (hence O. at the Edge of the Gorge). The change from first to third person also gave me more distance from the materials. It was on a later visit to read my own work at the Cheltenham Poetry Festival in the Spring of the following year that I heard Angela France reading a crown of sonnets. I blogged about it at the time and coming home it struck me that my sequence ought to take the same highly interconnected form. The 10th of my sonnets – precisely that moment where the Orpheus/Eurydice separation occurred – was expanded into two poems, absorbing some details about a parked car on a hill and others, also focused on transience, from Dante’s Paradiso Book 16. The final sonnet to appear picked up on some notes I’d made long before about seeing a hunting hawk rise up from the roadside clutching a mouse or rat in its talons. By this stage, the gorge, in its representation of the Other, had also come to be associated with life’s most apparent Other, death. The whim, or wish, or risky flight of my narrator to include or encompass the gorge itself became the poems’ hoped for goal. We’ve been running for eighteen months (‘running’ really feels like the right word) and as we prepare for the next season of titles I thought it might be an idea to offer an update on what we’re doing and what the coming year looks like. There are some exciting developments. Firstly, we’re really pleased with the little books we’ve been making recently. Each title teaches us a new lesson, whether that’s about printing techniques, paper stocks, typography or design. And in every post we should express our gratitude to the printer for indulging our play – while making one of this coming season’s books we clogged up or blew up (yes, really) four of his machines. Thank you Roy, and sorry! We are planning to have a launch event featuring readings by Andrew McNeillie, Nic Stringer and Martyn Crucefix, with an exhibition of work by Lucy Kerr and Phyllida Bluemel, on 11 November at Terre Verte Gallery in Altarnun, Cornwall. Please put it in the diary. That will take us to Christmas and into 2018, when we will be bringing you new poetry from Amy McCauley, Robert Lax, Dom Silvester Houedard, Sarah Cave and Keith Waldrop, creative non-fiction by Wolfgang Hildesheimer (translated by Nicola Barnes), as well as an experimental essay on ‘liminography’ by Rob Dickens. And then we have a very exciting new collaborative development for the second half of 2018, as we team up with the UK’s leading short fiction salon, The Word Factory, to present a series of short story pamphlets by some of the country’s most interesting writers. We will be announcing the project, as well as the first four writers, shortly, but they are all terrific. That should keep us busy, right? This weekend Guillemot made our roost at Port Eliot Festival – and it was the soggiest Port Eliot we’ve known. The rain was constant, the mud was deep. The plan was to make a daily newspaper, printing on a risograph with content provided primarily by ten talented students from Plymouth University. We started soon after nine each morning, tidying out the press tent from the previous evening and discussing what we had to cover that day, who was working with whom and how. Throughout the day the paper’s content was written, edited, illustrated, scanned, set, printed, folded and collated, and by midnight the following morning’s paper would be just about ready and packed for the morning’s distribution. It was terrific fun, thanks to the students and editorial team, but also thanks to the numerous visitors who came to see us throughout the festival. We had Guillemot friends like clinic’s Rachael Allen and Sam Buchan Watts, Mona Arshi, Hannah Silva (who contributed a sound poem haiku), Wyl Menmuir, Emily Barr and James Brookes popping in and out of the press tent, sharing poems and giving interviews, and we had contributions from the public. One of the most pleasing pieces we received came after we published a playful article about a monster sighting in the River Tiddy. The following day a boy named George came to the press tent to report his own sighting of the monster’s orangey fin breaking the surface of the river and of the marks in the mud where the creature had slithered in and out of the water. The editorial team was made up of John Kilburn, Charlie Sherratt, Lucy Kerr, Sarah Cave, Ben Smith and Luke Thompson – all writers and artists – but the content came mostly from the students. We had five illustrators and five creative writers from Plymouth University reviewing, interviewing, observing, playing, making comics, posters and fake adverts, then helping to fold and distribute the paper. The five writers were Shauna Crewes, Sophie Holman, Ropa Mugadza, Caitlin Brawn and Laura Reinbach, and the illustrators were Sally Mullaney, Elizabeth Rackal, Lily Treseder, Jade Broadhead and Eloise Levien. They were a wonderful team to work with – lively, talented and willing, and delivering funny, clever content every day. It was especially impressive to see the young writers and artists develop through the festival. None of them (none of us!) had done anything like this before, but as the days went by, working from nine in the morning until midnight, the work got better and better and was being produced much more swiftly. We did have a couple of problems to solve along the way, of course, mostly practical printing issues. The first was the paper and came right at the beginning of the print. The all-pervading damp meant that the original paper would not pass through the risograph and we had to hastily ship in a heavier stock at the last minute (thanks Dave!). Then there was the paper folder, which should have folded and collated the paper in minutes. Except it wouldn’t turn on. We put in a late night call to the students for help. They dashed back and the tent was soon full of laughter and cider as they hand folded every page of every copy. Over the weekend, that would be some 6000 pages. From the tirelessness of Shauna and Caitlin to the impressive speed and breadth of Sally’s contributions, each student brought something different and extraordinary to The Murmuring Guillemot. Everything we own is muddy, really muddy. Really muddy and really wet and covered in ants. The press tent, the computers, the desks, the risograph, the laptops, the ipads, the scanners and printers, the editor – all covered in ants… and mud. We would like to thank and congratulate everyone involved for a great job. This Friday, 5th May 2017, we will be officially launching Kate Walters‘ Iona Notebooks at Terre Verte Gallery, Altarnun. Iona Notebooks is a collection of Walters’ painting, drawing and writing from her times on Iona. The launch is an opportunity to meet Kate Walters, who will be giving a short talk on her work, and to get a preview of the exhibition that will be running at Terre Verte until the 27th May. The year is warming and guillemots are moving back into their cities along the cliffs. So while we’re being sociable, maybe we could have a little catch up. Our first pamphlet of the year was Jos Smith’s Sun. We used our favourite Mohawk Superfine papers and found some lovely solargraph and pinhole camera images by Dave Wise for the cover and to frame the insides of the book. The cover title is subtly embossed, which has really lifted it. We’re very pleased. Have a look and see what you think. To update you on the year’s publications, we’re already looking pretty full and busy, which is great, with work from both new and established writers and artists. Any day now, Kate Walters’ Iona Notebooks will be ready. This will be a limited edition art book, printed on Accent stock from GF Smith, and each will be hand numbered and signed by the artist. The book will be £12 and every order will come with six Kate Walters postcards, specially made by Guillemot Press for this edition. Instead of our normal dimensions, this book will be squared, giving the paintings, drawings and writing a little more space. In terms of new poetry, I’m really excited to see what the crown of sonnets by Martyn Crucefix is going to look like. It is currently being illustrated with a book design by the tremendously talented Phyllida Bluemel. We hope to publish this early summer, soon after our triptychs are ready. The letterpress triptych series is hugely exciting. Twelve poets, three poems each. Each triptych is printed separately in a limited edition of just 50 (plus 12, one each for the poets). They will be sold in box sets (price tbc). The work is all ready to go and we’re just trying to book time with the 1928 Thompson letterpress. The list of poets is astonishing. This year’s twelve are: Peter Riley, Mona Arshi, Toby Martinez de las Rivas, Rebecca Goss, Rowan Williams, Nathan Thompson, Sarah Cave, Isabel Galleymore, Thomas A Clark, John Deane, Robert Lax and Rupert Loydell. If you’re interested in this very limited edition letterpress series, please email us. Later in the year, we will have a debut collection from Nicola Stringer, a new pamphlet by Rosmarie Waldrop, and a new collection from Andrew McNeillie. There are a handful of further titles we’re waiting to finalise, including an interesting avant garde German translation, some American fragmented minimalism, a visual poem sequence, and a little photography, perhaps. In other news, our collection of machines we hardly know how to use is growing handsomely. The latest addition is a risograph. Photos to follow – once we’ve found a way of squeezing it into the nest. We would like to add hand and letterpress printers, and I spent a surprising number of hours contemplating guillotine trimmers the other night. We continue to receive (and encourage) terrific poetry submissions, but I’d like to invite something weirder for a small imprint we hope to launch. So what do you have in the way of visual or narrative material on alternative cartography, lost worlds, or the monstrous? We love the edgelands, both literal and metaphorical, and these exaggerations of the places beyond those we know continue to intrigue us. If you have ideas, work or research you think might interest us, please get in touch. We have been at sea over the festive period, looking back to shore. 2016 has been a stormy year and the Christmas seas were choppy. A strange climate to begin such an optimistic venture as Guillemot Press. But here we are gazing at the cliffs of 2016 and grateful for the work we’ve produced. We’re pleased for the relationships we’re building, the writers we’re representing, proud of our first few books and excited for the year ahead. In 2016 we published an exceptional new poet, Karl O’Hanlon, a beautiful forgotten poet, Sister Mary Agnes, and an exciting established poet, Melanie Challenger, as well as new prose from Rob Magnuson Smith and some revisited prose by Jack Clemo. We’ve had artwork from Tony Martin, Garry Fabian Miller, Rose Ferraby, John Kilburn and Kate Walters. We’ve had our first launch events and exhibitions, and the books (I hope) are getting better and better. 2017 is looking promising already, with new work due from Martyn Crucefix, Kate Walters, Jos Smith and Robert Lax, as well as a letterpress triptych series with 12 of our favourite poets, including Rebecca Goss, Rowan Williams, Mona Arshi, John F Deane, Peter Riley, Toby Martinez de las Rivas, Thomas A Clark, Rupert Loydell, Isabel Galleymore and Sarah Cave. The poetry of this series is brilliant and diverse, and the final two poets to announce (shortly) will further broaden the field. As well as these poetry titles, 2017 will see the beginning of a few rather different publishing projects, further books of beauty and wonder. More on this will follow soon. Guillemot Press would like to thank everyone who has supported and followed us over this first year. We hope you’ll stick with us into 2017 and wish you all a Happy New Year. On Saturday evening, Storm Angus hit Cornwall. He made terrible weather for a weary bird trying to make its way over Bodmin Moor, but the winds at sea were harder still. We took shelter in Altarnun, at the Terre Verte Gallery, with a brave, excellent audience, all there to see our new books, writers and artists. This was the official launch of Karl O’Hanlon’s And Now They Range. Karl came down from York and he read beautifully. He is a seriously promising poet, and And Now They Range is his debut pamphlet. He’s definitely a writer to watch and we’re excited to see what he’ll do next. Already, this little book has received some great comments, including from fellow poets Billy Mills and Toby Martinez de las Rivas. Billy described it as ‘one of the best first books by a young Irish poet that I’ve read for a while’. Karl read in front of an exhibition by Kate Walters, whose paintings feature on and within And Now They Range. They turn a great collection into an exquisite book. Kate was present at the launch and introduced her work so brilliantly, and although it was only a brief introduction to her practice, it became the subject of much of our after-event pub conversation in the King’s Head and we’re already talking about holding an evening that focuses solely on Kate and her work. The second reading of the evening came from the prize-winning short story writer and novelist Rob Magnuson Smith, whose pamphlet Henry and the Moon Baby is being officially launched Tuesday 29th November in Helston Museum. Rob’s pamphlet was illustrated by John Kilburn, whose playful image-making made an attractive contrast with Kate’s artwork in the gallery. John also presented his work and practice, touching on ideas of fourth and fifth spatial dimensions. This led to a series of difficult questions about physics, mathematics, chemistry and crystallology from a passing scientist in the audience. The audience was great and it was a pleasure to speak to everyone afterwards. We hope people enjoyed sharing our sheltered Altarnun crag with us as much as we enjoyed entertaining. I have to say, we forgot about Angus completely, and save for a treacherous flight home across the moor, we hardly noticed a gust or drip. Thanks must go to Richard Sharland of Terre Verte Gallery, who hosted us so generously. Terre Verte is a lovely space in a lovely place, and we hope this launch will be the first of many Guillemot events. Our sincere thanks to everyone involved. 19 November 2016: Terre Verte Gallery, Altarnun, Cornwall. 6pm. 29th November 2016: Helston Museum, Cornwall. 5pm. Next month we will be hosting the first of our exhibition and reading events at Terre Verte Gallery, Altarnun, on Bodmin Moor in Cornwall. Terre Verte is a lovely little gallery run by Richard Sharland, who has a great sense of the sort of space work needs. The gallery also happens to be in one of our favourite moorland villages. For a small village, Altarnun has an important place in Cornish history. Just down the road, John Wesley used to stay, and a tiny museum remains in the cottage that was built for him. It includes work from another prominent Altarnun figure, Neville Northey Burnard, a sculptor who began his career carving gravestones, then went to London to sculpt Romantics and nobles. In the Wesley Cottage Museum, they have a limpet shell cameo by Burnard. Altarnun also boasts the ‘Cathedral of the Moor’, complete with green man carvings, and a holy ducking well for curing madness. And this is where we’ll be on the 19th November at 6pm. There will be a pop-up exhibition featuring work by John Kilburn and Kate Walters, and readings by Rob Magnuson Smith and Karl O’Hanlon from new and forthcoming Guillemot Press titles Henry and the Moon Baby and And Now They Range. Entrance is £5, which will include a glass of wine. There will be lots of opportunities to talk to the writers and artists, as well as to pick up the latest Guillemot titles and to have these signed. There is a second event at Helston Museum on the 29th November. This will be a free event with Rob Magnuson Smith reading from Henry and the Moon Baby, which was inspired by the museum’s stuffed scarlet on exhibition. To meet Henry the Parrot and Rob the Writer, come along to the Helston Museum at 5pm. To buy a copy of the pamphlet in advance, visit us here. We look forward to meeting you, either in Altarnun or in Helston. If there are any queries, please get in touch. As we move towards autumn, we offer our debut poetry booklet, Harvest, by Sister Mary Agnes. We are delighted with this little book of newly discovered work from the contemplative nun-poet, Agnes, which we have paired with the ‘camera-less photography’ of Dartmoor-based artist Garry Fabian Miller. Sister Mary Agnes (1928-2014) was a nun in the Poor Clare monastery of Lynton in Devon. She published three slim volumes of her poetry through the 1970s with Workshop Press and Thornhill. Her debut, Daffodils in Ice, was a surprise hit for Workshop’s editor Norman Hidden, outselling their other debuting poet that year, Andrew Motion. Newspapers and the television took an immediate interest in Agnes and her contemplative life, and she found her life and writing the subject of many articles and programmes. I have a window in my cell – the view is magnificent, hills and trees & wonderful sunsets. There’s a cypress tree right outside the window … . I love watching it. You can learn so much from watching things & listening to them. Year after year, season after season, Sister Mary Agnes watched and listened. The cypress tree recurs throughout her poetry, as do the flowers and birds of the Lynton garden. Her poetry brought Agnes many admirers, among them Kathleen Raine and Elizabeth Goudge, but as her writing gained momentum, she herself was facing crisis. She had fallen in love – a more worldly sort of love – and while the poetic slippage between the divine lover and the worldly beloved is extraordinarily powerful in her poetry, the tension between monastic discipline and romantic promise led her to the brink of despair. She suffered a terrible breakdown, attempting to end her life, and after almost thirty years clositered at Lynton, Agnes left the monastery, first moving to convalescent homes, then to London. There in the city she continued her quiet life of devotion. Sister Mary Agnes’s three published collections are Daffodils in Ice, No Ordinary Lover, and a world of stillnesses. Following her breakdown, she published no more. Yet she continued to write, and when she died, in 2014, she left behind a number of full manuscripts and a great many occasional poems. From these, Harvest was gleaned. The poems of this 40-page booklet chart the period of Agnes’s hope, despair and recovery, offering her signature blend of death-infused delight and devotion as the physical presence of Christ and Lover are explored in beautiful crystal-clear imagery. The launch of our first title, Jack Clemo’s short story The Clay-Dump, with artwork by Tony Martin, was held on Friday night, on Jack Clemo’s 100thbirthday. We went deep into the heart of the China Clay country near St Austell, Clemo’s native landscape, to Wheal Martyn China Clay Park and Museum. Wheal Martyn is a fascinating site, the highlight being the viewing platform over the working Wheal Martyn pit, and the museum currently has an exhibition about Clemo’s life and writing in the foyer, with the poet’s writing desk and typewriter. We spread out our wares on a table at the café entrance as preparations for the event began, then settled in for an evening of apocalyptic rural-industrial clayscape symbolism. There were readings of Clemo’s poetry from Luke Thompson and Causley House poet-in-residence Isabel Galleymore, followed by a performance of one of Clemo’s early Cornish dialect stories from Rabbit Theatre’s David Mynne. Contrasting Clemo’s early rejection of the natural world, Jane Darke introduced The Wrecking Season, a film about beachcombing made with her husband, the playwright Nick Darke. Rounding off the evening was Philip Marsden, reading from Rising Ground, his book about Cornwall, which includes a chapter on Clemo and the clays. It was a pleasant evening, and we were proud to launch Guillemot Press and The Clay-Dump on such a unique occasion. The Guillemot is a bird of the seas and coasts, and Cornwall is our home. When looking for people to help produce our books, we were pleased to find so much so close. Up the road in Wadebridge, we found Pickle Design, the lovely company that produced the bridled guillemot logo above, as well as the logo you will find in the books. They also made a wooden hand stamp of the Guillemot, which we will be using in the future to make every single book unique. Down the road in Lostwithiel, we found Palace Printers with its owner Roy, an experienced printer happy to play around all day with paper colours, sizes and styles, binding options, end papers and covers, and who has been patient with indecisive birds like us. The idea of Guillemot Press is simple: to publish and encourage the sorts of stories and poems we want to read. Little books, beautiful books, intimate books, books that are good to hold as well as to read. Books that fit well in a pocket. Books of the land, and the people of the land. Quiet books, rapturous books, wise books.